Recipe from Pat Curran, Senior VP, Division U Operations, Wal-Mart. "This recipe is the All-American comfort food. 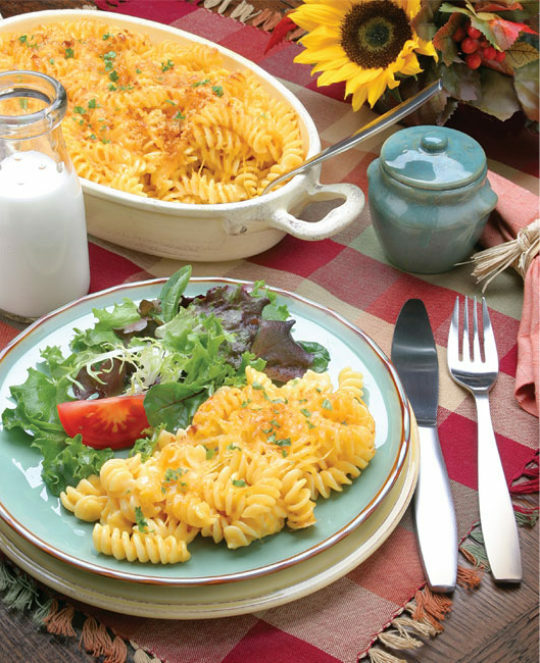 Prepare this as a side dish, or if using as a main dish, add some veggies..."
16 ounce package of pasta – elbow, fussilli, rigatoni, pick your favorite! If serving as a side dish, limit portion size to one half to three-quarters of a cup. This equals fewer calories and just as much flavor! Boil pasta according to package directions, omitting salt and fat. In separate saucepan, melt butter. Add flour and stir together. Slowly add milk, stirring constantly to form a roux. Adding milk too quickly will cause roux to be lumpy. Reserve about 2 ounces cheese. Add the rest to the sauce, along with mustard, sour cream, and salt and pepper. Stir until cheese is melted and sauce is smooth. Combine sauce with cooked noodles and pour into casserole or baking dish. Sprinkle remaining cheese on top. Bake uncovered at 350 for 20 minutes. This recipe makes 8 (1 cup servings).